Unravel formidable puzzles with your supernatural gift for crime-solving. "Hidden Object games can be addictive, and Psych is no exception. The game is broken up, in a good way, by additional puzzles that are pretty stimulating. I can't wait to play more!" Based on the hit USA TV show, Shawn Spencer is a private detective who has an almost supernatural gift for crime-solving – so much so that the local police department hires him as their Psychic Advisor. Shawn quickly finds that his gifts, although formidable, don't exactly keep him out of trouble. 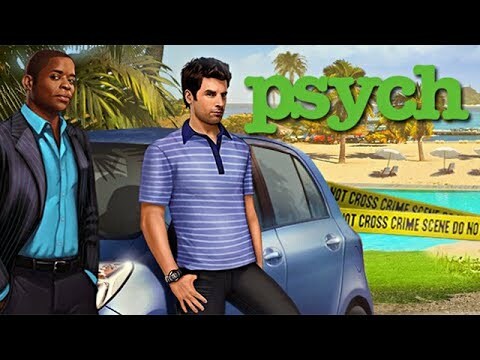 Solve a deadly case with Shawn, Gus, Lassiter, and more from the Psych cast as you travel to over 40 locations in sunny Santa Barbara, California. Complete dozens of mini-game puzzles, enjoy hilarious dialogue, and unravel mysteries in this humorous Hidden Object adventure.